I received this book from Blogging for Books for this review. All thoughts and opinions are my own. This post may contain affiliate links. When I read the description of the new cookbook Snack Girl to the Rescue! , I was intrigued. I am a major snacker, and in fact, I find that I manage my weight the very best when I allow myself to eat small portions frequently throughout the day. Snacking can most definitely work against me, but if I am intentional about what I am snacking on, then it actually works in my favor. Unfortunately, Snack Girl to the Rescue! was a fail for me after 3 strikes. They might seem minor to some folks, so I’m not necessarily suggesting that you skip right over this book. I’m just sharing my personal experience. I agreed to review this book having only seen the cover, so I didn’t realize that there weren’t any pictures included. I also didn’t realize just how important pictures were to me in cookbooks until I was staring at a cookbook that didn’t have any. It was a bummer, you guys. When I first flipped through the cookbook, I spotted a recipe for sweet potato and black bean burgers. I knew I wanted to try that first, but I didn’t have a bookmark on hand and I didn’t want to dog-ear the page. I shut the book without worry, knowing that I could look up sweet potato in the index. Only, that didn’t work. No sweet potato designation back there at all. So I had to go page-by-page through the book until I found it again. Ok, so the recipe I started with was, in fact, sweet potato and black bean burgers. I followed the recipe precisely (not something I’m known for, but if I’m reviewing a cookbook I will stick to the instructions). Those poor burger patties never amounted to more than a pile of hot mush. They looked revolting and while their taste was reasonably decent, they didn’t work AT ALL as a burger. A side dish? Maybe. Definitely not the main attraction. It was bad, friends. I want to stress to you that in the end, I only made one recipe. I don’t think that’s enough data to conclude that the book doesn’t have good recipes in it. But it was the 3rd strike for me and enough for me to give up on the cookbook. Do you have strong feelings about pictures being included in cookbooks? And are you a rampant index-user, like me? Are these just my cookbook quirks? I know, I know…this post should be all about great lunch ideas for kids, since we’re in the midst of the back-to-school season. But I didn’t want the parents to feel left out! Whether your work space is on a factory floor, behind a desk, or in the driver’s seat of a vehicle (Carpool line! Hello! ), you need something to snack on while you are working hard, too! So I created a list of some of the healthy snacks I have stocked my pantry with for the grownups when break time rolls around. Some of the snacks were recently provided for review and I fell in love, and others are products my family discovered a while back! Affiliate links below. FiberOne 90 Calorie Brownie. These are a total favorite of mine. So yummy. So friendly on the waistline! So satisfying! Saffron Road Crunchy Chickpeas. The wasabi flavor will WAKE. YOU. UP!!! And either way you go, these are tasty little treats, packed with flavor. KIND bars. Have you tried these??? You guys. SOOOOO good! And they really help me to stop grazing once I have one. Very filling and did I mention that they are REALLY good? These are new to me, and I’m a little bit bitter that I didn’t know about them sooner. Just sayin’. PopCorners. I so rarely get to enjoy these because Tim always takes them to work. As I recall, though, they are REALLY good! 🙂 Definitely be sure to try the barbecue flavor!. Balance Mini Energy Bars . I love the taste of these bars, but even more, I love the size! I’m working in New York this week, and I’m spending a lot of time creating cooking demonstration videos. I’m surrounded by food all day, and yet, there is very little opportunity to eat! I put a handful of these bars in my purse so that I could have something to eat that would give me a boost! Lovely Candies. These seriously taste like homemade candies you could only get from a loving grandmother. I don’t know how that got that all wrapped into little squares of wax paper, but they did. Consciously made. Gluten-free. A must try! Van’s Crackers and Bars. I wrote about Van’s crackers earlier in the summer, and we recently had some new flavors and just adored them, as well. They also have cranberry almond bars that will REALLY help curb some hunger pains when you need to power through until dinner. Love this brand!!! Everything is gluten-free, as well! Those are some of my suggestions that maybe weren’t already on your shopping list! I’d love to hear what you snack on while you get through your work day. Anything you just can’t live without? Any new finds? Let’s hear it! “Let me do it, mom!” are words that frequently come out of Darah’s mouth. She is working so hard to be independent, and I am trying my best to listen to her and give her the opportunity to do things all by herself. It requires patience on my end, to be sure, but I can see the pride she has when she accomplishes something on her own. I imagine that it must be a very empowering feeling to a 3 year old! One step I have taken toward giving Darah the freedom of choice and the ability to take action on her own is with her afternoon snack. It is part of her daily ritual to have a little something to eat after her quiet time. I used to prepare the snack for her, but lately I have been stocking the snack bin in the pantry and letting Darah go in on her own and select the item she wants that day. Darah LOVES getting to make her own decision, and she loves to talk with me about her different options while she mulls over her options. She also loves to work on opening her snacks herself, although this is an area where mom is still needed to help. It is my job to make sure that every option in the bin is a healthy choice. Del Monte Fruit Cups have been introduced to the snack bin, and they get snapped up VERY quickly, I have to say. I recently went to Walmart to restock our supply of fruit cups, and while I was there I picked up two new flavors, Diced Apples & Pears with Caramel Flavor and Diced Pears with Vanilla & Spice. Don’t those sound simply scrumptious for the fall and winter seasons? I spotted them on the shelves at my local Walmart a few days ago. If you want to come along with me on my entire shopping trip, click here to see what I saw while grocery shopping at 6 am! (At. $2.28 for a package of four, these cost just .57 per snack). After I got home, Darah helped me unload the groceries and very quickly found her new snacks. She was thrilled, and she helped me add them to her snack bin so that they could be an option for her later that day. After her quiet time (and she actually napped that day! Woo hoo!) Darah made a bee line (or should I say ladybug line? She was trying out her Halloween costume…) for her snack bin. After double-checking with me that it was time for a snack, she looked over her options and made her choice. Del Monte Fruit Cups, please! Darah was quite pleased with her selection, and after trying to get it open, herself, she asked me for some assistance. While she doesn’t normally wear bibs, I thought it might be wise to put on a smock over her costume since these fruit cups do contain a light syrup and the odds of it landing on her costume were good. I sat with her while she ate, and we talked about what our plans were for the afternoon. We decided that a walk down to the park might be fun. While we chatted, she made a point of telling me that she liked her snack because it was just the right size for her. I think she’s right! After she had eaten most of her snack, I asked her if it tasted really good. She didn’t respond to my question with words, but instead, with action! As I watched Darah slurp down every bit of her snack, I couldn’t help but think about how glad I was that this product is free of high fructose corn syrup. That makes it a #SmartSnack in my book, and means that it will be in regular rotation in our snack bin. I’m especially looking forward to stocking up on this to use when apples and pears aren’t in season and finding tasty ones is a challenge. That’s the perfect time to reach for a Del Monte Fruit Cup! One other idea I have for this healthy snack is to use it at breakfast. Tomorrow morning I’m planning on giving Darah a fruit cup along with her oatmeal and letting her combine the two for a fruity twist to a hot breakfast staple! Darah will be able to control the amount of fruit she uses, and I think that will make it a lot of fun for her. Do you have any tips for ways to make snack time for your kids a more enjoyable experience, and one in which they take some ownership? Do your snack options include Del Monte products? Drop the company a line on their Facebook page or on Twitter to share your tips and tricks or to get more information about all the ways Del Monte can help make snack time healthy and fun. I am a member of the Collective Bias™ Social Fabric® Community. This shop has been compensated as part of a social shopper insights study for Collective Bias™ and Del Monte #CBias #SocialFabric. All thoughts and opinion expressed here are strictly my own. I don’t watch cable tv, so I usually miss all the latest commercials. But even I have been hearing about this product called Yonanas. It’s getting attention on many different media outlets, including magazines andblogs, which I do read! Yonanas is a machine that turns frozen fruit (bananas, strawberries, mangoes, you name it!) into a creamy product that has the exact same consistency as ice cream. But it’s JUST FRUIT!!! Check out this quick video to get a demonstration of how Yonanas works. What you are seeing below is consistent with what I experienced when making Yonanas for the first time. 2. This is an AWESOME tool for anyone with a sweet tooth or with family members who like cold, sweet treats. The flavors I crave more than any other are cold and sweet, so to have the opportunity to make something so good and not have any sugar or fat added to the mix is a really good thing for me. I actually served some Yonanas to Darah as part of her dinner the other day (and why not? What I made only had bananas, blackberries and raspberries in it!). Also, in my pregnancy I really crave ice cream, and I love the idea of reaching for some Yonanas when the craving hits hard. 3. Yonanas is dishwasher safe. Hallelujah! I have decided that the product Yonanas makes is so good that devoting limited shelf space to this one-trick pony is worth it! Just be sure to use the really ripe bananas, as they are the sweetest! There are a few drawbacks to Yonanas, but again, both things are not sufficient to make me not endorse the product. 1. I found that it is best to only make as much yonanas as you want in one serving. I made a large batch once with the idea to store away the rest, and I found that when I returned to eat the yonanas, the stuff was pretty darn hard. It did thaw out, but it took about 20 minutes for it to get soft enough to dig back in with a spoon easily. If you plan ahead that’s not a problem, but if you want some ice cream NOW, then you’ll be disappointed. 2. When making your Yonanas, you should disassemble the device in order to get all of the yummy goodness out. I found that a fair amount of “ice cream” was still inside the device once I had finished making my treat. It was no big deal to scrape it out with a spatula, but that’s something to keep in mind as an extra step. Yonanas can be purchased for $49.99 at a wide variety of retailers (see store listings here). Disclosure: I received a complimentary product for review purposes. The thoughts and opinions expressed here are strictly my own. So you’ve likely seen several different types of squeezable baby foods hitting the shelves over the last few years. This dispenser method is a ridiculously HUGE hit with Darah. Yes, she is too old for “baby” food. But let me tell you, if there’s something that is really good for her (like it containing an entire serving of fruit, with no preservatives and no added sugar) and she jumps at the chance to eat it, I have NO problem feeding it to her! Buddy Fruits is one of those items. And actually, it isn’t baby food, per se. It’s meant for anyone and everyone who loves fruit and who needs a convenient way to get a serving in while going about their busy days.I’ve tasted their pure blended fruits and they are delicious! I would definitely eat one, myself. They are SO perfect for car trips or to have on hand when you are running errands. They are chock full of only good stuff…fruit! They also carry pure fruit bites. These are crazy good. They are very sweet, but that sweetness is totally natural, since these don’t have anything other than concentrated fruit juices and a bit of pectin so that they will all stick together. The package has one complete serving of fruit! My only complaint is that the packages are quite small. They make a perfect snack for a youngster, but as an adult, I found myself wanting much more once I’d emptied the package. Perhaps I need to watch my portion control, but I would have easily eaten 2 pouches in one sitting. 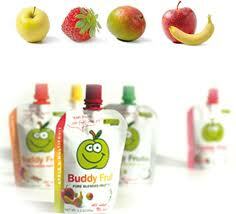 Our experience with Buddy Fruits was very positive. These are items I will be purchasing again in the future to have on hand. Darah absolutely loves them and I love knowing that they are so good for her. Buy it! : Buddy Fruits are available at many different stores all over the country (and they are priced REALLY well on Amazon !). The odds are quite good that you’ll be able to find them! Use their store locator to see where your nearest retailer is! Win it! : One lucky Stuff Parents Need reader will win a display mix of Fruits and Pouches, just like what I received! The contest will run until June 18th at 11:59pm EST when a winner will be selected via Random.org. The winner will have 48 hours to respond to winning notification before the prize is forfeited and a new winner is selected. Open to residents of the United States. Limit one entrant per household, please. Mandatory entry: Tell me your LEAST favorite fruit! My answer: If a plum isn’t perfectly ripe, it’s always disappointing to me. 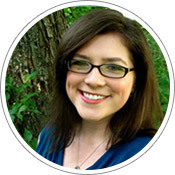 Be sure to check out my other current giveaways, found on the sidebar of my homepage. Does anyone out there have a similar struggle with food because you are at home all day? It is SUPER hard for me to stay out of the kitchen, just grazing and snacking all day long! I’ve realized something over time: I am a grazer, plain and simple. I like to eat little bits of food all throughout the day. I don’t think this is really going to change about me anytime soon. It’s just who I am. But here’s what I have complete control over: the foods that are available for me to eat. I can tell you now that if there are grapes in the fridge I will happily munch on them. If there are double-stuff oreos in the pantry I will happily munch on them. I’m gonna be munchin’, so it is my job to make sure I have the right stuff on hand for all my snack sessions! 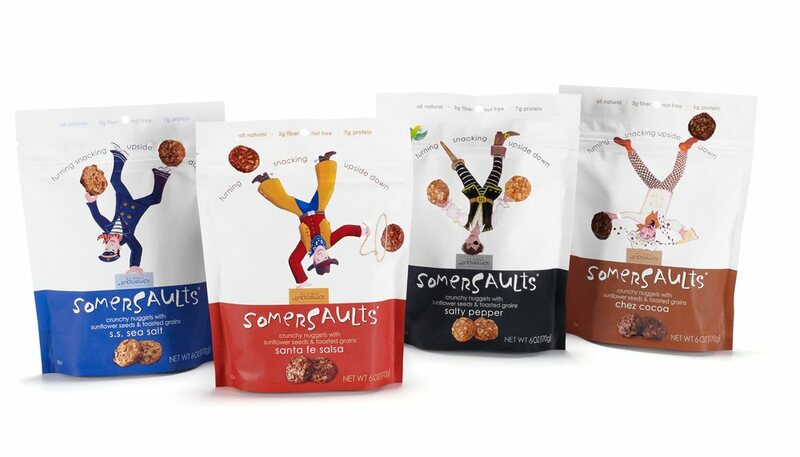 Each serving of somersaults has 1/2 the fat and even more protein than a serving of almonds, which I have always considered to be a powerhouse of a snack. Move over, nuts! My only real complaint is that these aren’t sold anywhere even remotely close to where I live, and I live in a respectably-sized city! Please find your way into Whole Foods, or EarthFare or Food Lion! The silver lining in this cloud is that you can buy direct from their website, though. Buy it! : Maybe you will have better luck than me. Check their store locator to see if you can find a place near you that stocks them. I promise you, it is a purchase you won’t regret! Win it! : One lucky Stuff Parents Need reader is about to be doing all kinds of somersaults, because you will be getting an awesome prize pack of Somersaults with every flavor and every size. Woo hoo!!! Hopefully the winner won’t live within driving distance of me, or else there might be a risk of some mail theft. 😉 The contest will run until March 23rd at 11:59pm EST when a winner will be selected using Random.org. The winner will have 48 hours to respond to winning notification before the prize if forfeited and a new winner is selected. Open to residents of the United States. Limit one entrant per household, please. Mandatory entry: Tell me about a snack you currently turn to when you get the munchies, whether it is good or bad for you! My answer: if I’m seriously hungry, chips and salsa will fill me up pretty quickly. Having chocolate in the house is very rare, not because I don’t buy it, but because I eat it so quickly. Be sure to enter my other current giveaways, found on the sidebar of my homepage.